IDAHO FALLS – Nationwide, noxious weeds run roughshod over 2,703 square miles of wildlife habitat every year. Seventeen million acres of federal land in the western U.S. are infested with noxious weeds, and the spread is growing at an annual rate of 8 to 12 percent. While exact numbers for the spread in Idaho aren’t available, experts say noxious weeds are one of the biggest contributors to the loss of wildlife habitat. According to the Idaho Department of Agriculture, noxious weeds cost the state $300 million a year through eradication efforts and loss of resources. Roger Batt, a spokesman for Idaho Weed Awareness, said 8 million acres of state land are infested with noxious weeds. Across the western United States, Batt said, noxious weeds would spread at a rate of 3,200 acres per day if undeterred. Noxious is a legal classification. According to the Department of Agriculture, there are 67 species of noxious weeds in Idaho. Under the designation, landowners are obligated to fight the spread of noxious weeds on their property. Noxious weeds get mixed in with large shipments of imported seed and are nearly impossible to detect, Thomas said. Once here, they spread like wildfire because there are few, if any, predators to hold them in check. For the most part, land management officials fight weeds with herbicides and biocontrol. Because of the negative effects of chemicals, biocontrol – or the introduction of predators – is a preferred method, but can be time-consuming. Identifying the problem is one thing, but stopping the spread is nearly impossible. While efforts to better screen imported seed are in place, when dealing with a barge full of seed, finding the noxious weed seeds is something akin to searching for a needle in a haystack. In addition, most people can’t identify noxious weeds. Nurseries sell them unknowingly, and many people have them in their yards. Even if management officials were able to halt any new introduction of noxious weeds, the plants already in place can spread at an alarming rate. Faulkner said one of the newer problem weeds is rush skeletonweed. Batt sent out early this month a news release about an increase in the spread of poison hemlock. 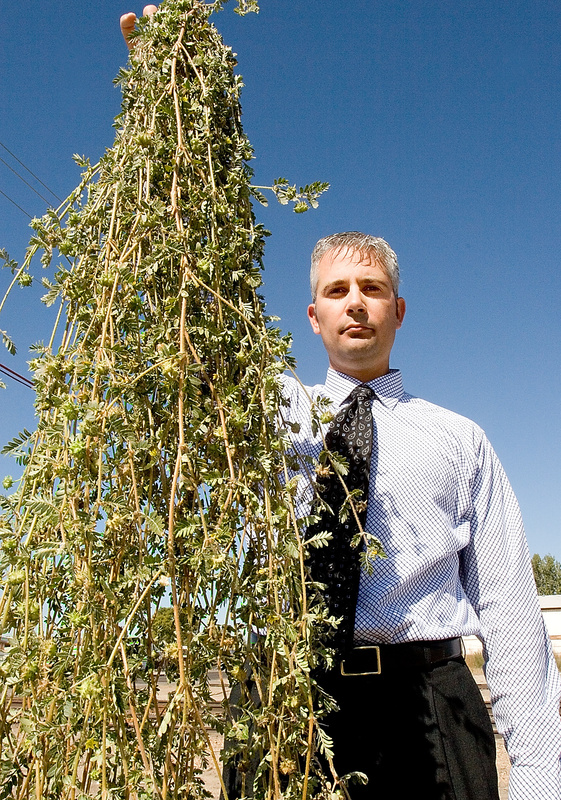 The weed has taken root in every county in Idaho. Humans occasionally eat it thinking it’s wild parsley or dill, Batt said, while livestock can ingest the plant when forage opportunities are low – or if it is mixed in with grasses. In addition, Faulkner said humans often help spread weeds by taking trips into the backcountry on horses or ATVs. Both Thomas and Faulkner said the problem is not going away, but with more help from the public, the effect of noxious weeds could be less catastrophic and expensive. That starts with becoming familiar with the plants that are noxious, and then making sure you aren’t helping to spread them. “Nobody recognizes what it is until it’s too late,” Thomas said.